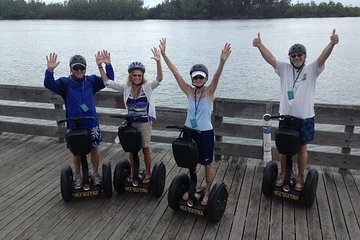 Experience the Fort Lauderdale and Hollywood Beach areas of Florida in the evening on this educational and entertaining guided, 1-hour, small-group Segway tour. Cruise down the Hollywood Beach Boardwalk and past the historic Garfield Street Paddleboard Courts and Hollywood North Beach Park. Learn about Hollywood Beach’s history while winding through the back streets. Guided Segway training, plus a helmet and safety equipment are included. Dress in weather-appropriate clothes with flat, closed-toed shoes. Hay recorridos a pie y recorridos en autobús, pero este recorrido único en Segway nocturno ofrece una perspectiva completamente nueva en el área alrededor de Fort Lauderdale. Montar en un Segway no es difícil, pero es importante saber cómo maniobrar uno. Este tour comienza en el Hollywood Beach Resort con una sesión de entrenamiento breve pero completa para garantizar que todos se sientan cómodos y bien informados sobre su Segway. Además, todos los pasajeros deben pesar entre 100 y 300 libras para participar. En el tour de 1 hora en Segway por Fort Lauderdale, recorra el suave Hollywood Boardwalk de 2.5 millas, admirando la vista estelar del Océano Atlántico en el camino. Escuche a la guía hablar sobre la historia de esta hermosa área turística a través de un auricular incluido. El recorrido de 1 hora cubre un total de cuatro millas, pasando por tiendas y restaurantes locales, además de los históricos Garfield Street Paddleboard Courts y Hollywood North Beach Park. Por supuesto, ningún tour está completo sin un helado gratis, un final perfecto para esta aventura de Segway en Fort Lauderdale, que concluye en su punto de partida en Hollywood Beach. We had a great time on this tour. Our tour guide, John, was friendly and professional. He also personalized the tour for us and made it exactly what we wanted, including information and history about the Broadwalk as well as time to just have fun with the Segways. Would definitely recommend!